Reading and share top 17 famous quotes and sayings about Impediments by famous authors and people. 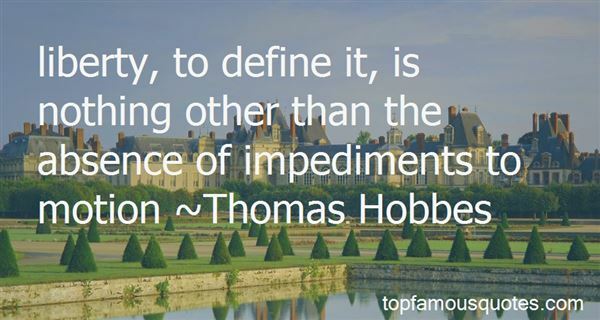 Browse top 17 famous quotes and sayings about Impediments by most favorite authors. 1. "Religion can be one of the greatest impediments to finding God." 3. "The greatest impediments to changes in our traditional roles seem to lie not in the visible world of conscious intent, but in the murky realm of the unconscious mind." 4. "To generate an enduring peace, we will each have to continue to make progress as Christ conscious leaders, becoming increasingly aware of our unity with others and expanding our ability to receive Divine Love and be a vehicle for Divine Love. We will each have to detach from any impediments in our tribes, our families, and our own self-will that deter us from a commitment to fulfill God's purpose in our lives, to do our work, and to continue our lifelong transformation as Christ conscious leaders. And we will have to come to realize that, in partnership with the Eternal Absolute, we each have the power – and thecalling – to build the kingdom of God on earth." 5. "It is a very strange sensation to inexperience youth to feel itself quite alone the world, cut adrift from every connection, uncertain whether the port to which it is bound can be reached, and prevented by many impediments from returning to that it has quitted. The charm of adventure sweetens that sensation, the glow of pride warms it; but then the throb of fear disturbs it; and fear with me became predominant when half an hour elapsed, and still I was alone." 6. "This may be the one clear truth of the so-called border issue: Put a poor country next to a rich one and watch which way the traffic flows. Add impediments, the traffic endeavors to flow around them. Eilimate disparity. the traffic stops." 7. "And thus, through the courage and great skill in obstetrics of Queequeg, the deliverance, or rather, delivery of Tashtego, was successfully accomplished, in the teeth, too, of the most untoward and apparently hopeless impediments; which is a lesson by no means to be forgotten. Midwifery should be taught in the same course with fencing and boxing, riding and rowing." 8. "The closer Iraq approaches freedom and democracy, the more impediments and barriers the terrorists will erect." 9. "[He] believed both love and hate to be irrelevant. To him, they were "impediments of the human condition," and, in his words again, "imagine what could be accomplished if the human race would only shed its humanity." 10. 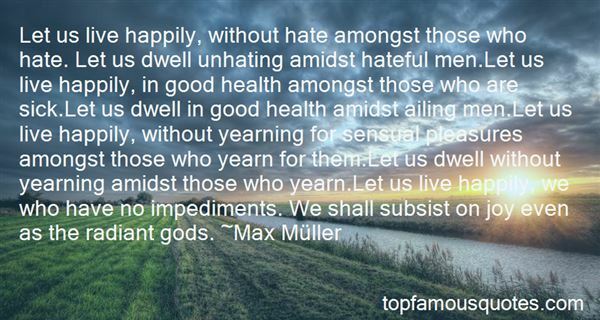 "Let us live happily, without hate amongst those who hate. Let us dwell unhating amidst hateful men.Let us live happily, in good health amongst those who are sick.Let us dwell in good health amidst ailing men.Let us live happily, without yearning for sensual pleasures amongst those who yearn for them.Let us dwell without yearning amidst those who yearn.Let us live happily, we who have no impediments. We shall subsist on joy even as the radiant gods." 11. "The one general theme I took away from that first week with my new friends, was that everyone had their issues. Life in its simplest form is an attempt to deal with and avoid potential impediments. Some families take dysfunction to lofty heights while other break apart like Oreos mixed in a blender." 12. "I should have written you a letter, it was too late to make the deaths of my brothers an excuse. Since they died, I wrote a book; why not a letter? A mysterious but truthful answer is that while I can gear myself up to do a novel, letters, real-life communications, are too much for me. I used to rattle them off easily enough; why is the challenge of writing to friends and acquaintances too much for me now? Because I have become such a solitary, and not in the Aristotelian sense: not a beast, not a god. Rather, a loner troubled by longings, incapable of finding a suitable language and despairing at the impossibility of composing messages in a playable key--as if I no longer understood the codes used by the estimable people who wanted to hear from me and would have so much to reply if only the impediments were taken away." 13. "Awkward approximations, dull stammerings which cannot convey my sense of exhilaration as I seem to burst impediments, to exceed bounds of the possible, to experience, in the ruins of the human, the birth of something utterly new." 14. "Liberty, to define it, is nothing other than the absence of impediments to motion"
15. "A man may read the figure on the dial, but he cannot tell how the day goes, unless the sun shines upon the dial: we may read the Bible over, but we can not learn the purpose, till the Spirit of God shines into our hearts. O implore this blessed Spirit! It is God's prerogative-royal to teach: "I am the Lord thy God, which teacheth thee to profit." Is. 48. 17. Ministers may tell us our lesson, God only can teach us; we have lost both our hearing and eye-sight, therefore are very unfit to learn. Ever since Eve listened to the serpent, we have been deaf; and since she looked on the tree of knowledge we have been blind; but when God comes to teach, he removes these impediments." 16. "Here was a woman about the year 1800 writing without hate, without bitterness, without fear, without protest, without preaching. That was how Shakespeare wrote, I thought, looking at Antony and Cleopatra; and when people compare Shakespeare and Jane Austen, they may mean that the minds of both had consumed all impediments; and for that reason we do not know Jane Austen and we do not know Shakespeare, and for that reason Jane Austen pervades every word that she wrote, and so does Shakespeare." 17. 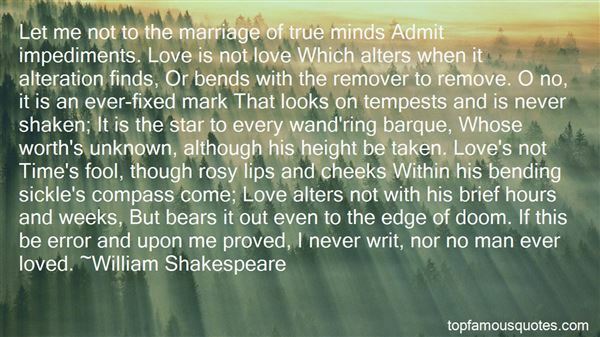 "Let me not to the marriage of true minds Admit impediments. Love is not love Which alters when it alteration finds, Or bends with the remover to remove. O no, it is an ever-fixed mark That looks on tempests and is never shaken; It is the star to every wand'ring barque, Whose worth's unknown, although his height be taken. Love's not Time's fool, though rosy lips and cheeks Within his bending sickle's compass come; Love alters not with his brief hours and weeks, But bears it out even to the edge of doom. If this be error and upon me proved, I never writ, nor no man ever loved." I think paranormal experiences are very personal, again, if they are that. Yes, sometimes I've felt that some things I would personally believe enough for me to take action on it... like, you know, I felt something happen in a hotel once that made me never stay there again."